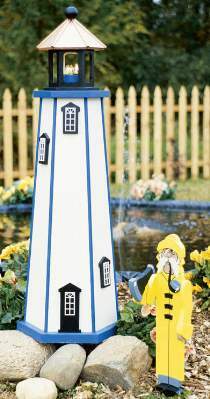 The 4 foot Lighthouse is a perfect size for either an indoor or outdoor decoration. Wiring harness holds three 7-1/2 watt clear bulbs. Easy to install white plastic window grids add a realistic touch. #3307 Hardware Package, as well as an optional #1623 Copper Lighthouse Roof Kit can be ordered separately. The 2 foot Mariner figure is made from 3/4" pine and 1/4" plywood. With his telescope at the ready he is keeping a sharp eye on the horizon. Order two plastic eyes separately. Patterns drawn FULL SIZE. 4’ Lighthouse Hardware Parts Package includes seven white plastic window grids, brass escutcheon pins, a three socket wiring harness, three steady burn light bulbs, all necessary wood dowels and the decorative wood ball for the top of the project. Project plan, wood and paint are not included. Copper Lighthouse Roof Kit is designed for use with the 4 Foot Lighthouse project in plan W2274 ONLY. It includes a 12" x 38" roll of 36 gauge copper sheet, 6 pieces of 3/8" dia. x 6-1/2"L copper tubing, brass escutcheon pins, steel wool, plastic spatula and complete installation instructions. SAVE with the Lighthouse Special which includes the #W2274 and #W2301 plans, the #3307 Hardware and 1 pair of brown eyes.